Do you grow marijuana or are you thinking of starting your indoor growing project of cannabis? One of the most important products you will need is an indoor growing lamp. But don’t go pick up an old indoor grow light. Things have changed in the last couple of years, and now grow lamps are inexpensive and much better because of the new LED technology. LED grow lights offer a full spectrum of colors, just like the colors of real sunlight. 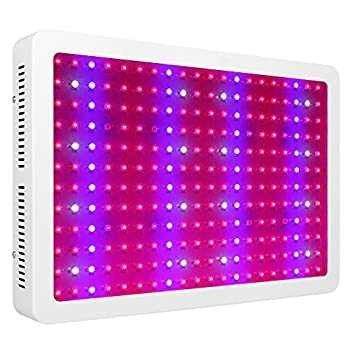 1 What Kind of LED Grow Light Do I Need? 7 How to Use LED Grow Lights? 8 Why Choose LED Grow Lights? Selecting a good grow light for your marijuana crop depends on a couple of things. You need to have enough light when the plants are growing and even more LED coverage when plants are blooming. But deciding on the perfect LED option is a very customized decision, because it depends on the number of plants you have and the space you have dedicated to growing and whether you plan on supplementing with other lamps during the flowering stage. Not to worry though. You are making the right decision when you think of LED. Remember LED offers high tech growing technology and the best part about using LED lights is that you don’t have to replace bulbs or deal with those oldballasts. You don’t even have to worry about the lamp running too hot either. These were problems that occurred with both the old HID and the HPS light lamps. Still, we understand that finding the right LED lamp can be a bit difficult because there are so many options on the market today. Take into account the area you are going to cover with light. by knowing the square footage of the area you are planting in you will better know how many lights and lamps you need to cover this area. Understand the different phases of your marijuana plants. If you use these lamps for the full growth Circle select a full spectrum LED grow light system. Consider the angle of the LED lens and the dispersion of light that the LED bulbs offer. Generally speaking, the greater the angle, the more coverage the lights will offer. Consider your budget. You want to get all the features that you need but you should also stick to your budget. Full spectrum LED grow lights are rather new on the market, so not all Growers are familiar with the benefits of these lighting systems. The giant fluorescent LED lamps that many growers used to use are no longer that efficient. Full-spectrum light systems are better because they offer a full spectrum of different colored lights just like sunlight. They don’t need to be replaced for a lot longer. If you are running on an old outdated grow lighting system then it’s time to change to full spectrum LED panel today. You will get more efficiency when it comes to your electrical use, and your plants will give you a better yield. Consider updating an outdated system to a full-spectrum LED panel today. The following are three LED lamps we want to review for efficacy , price and ease-of-use. When you look for LED grow lights online you will see a wide range of choices. But when it comes to growing cannabis, you want something more than just a lighting system that just includes bulbs with different colors of the spectrum. Don’t get me wrong, these less expensive LED light panels can get the job done, but if you can afford it, get a good panel to begin with. The thing we like best about the Viparspectra 1200 is that you can turn certain lights on and off as you need. This gives you the ability to create optimal growing conditions and provide plants with the best growing conditions. The vegetative switch allows you to reduce red light and increase blue. When in the bloom stage you can reverse the process. Compares to the traditional 1200 watts but does not consume that much. It only consumes about 524 watts. 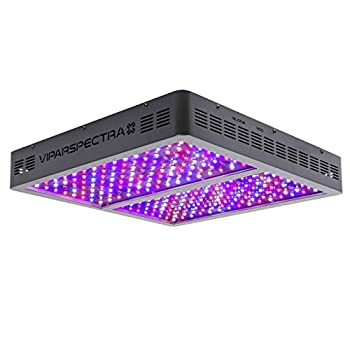 The Viparspectra makes our top marijuana LED lamp reviews list because it has an output of 1200 watts, but only draws about 524 watts of power. We also like the flexibility of being able to turn certain colors on or off as you need during the growth cycle. And to top it all off it comes with a full 3 year warranty which is quite extensive. I’ve always thought that when a company offers a long warranty it is because they know that their products are great. The only disadvantage we see is the slightly high price. But the quality of the product more than makes up for this. Another minor concer is that the lamp gives off inconsistent wattage. The manufacturer claims it is a 1200W system but sometimes this fluctuates between 900W to 1000W. Another great LED lamp that we like and have decided to add to our LED grow light review is the Morsen 2400W. Yes! It is a little on the expensive side, but it does make a great lamp for your marijuana plants. The Morsen 2400W LED light works on all phases of plant growth. And it works well with a number of different growing mediums as well. So whether you using water solution culture, soil culture or pot culture this LED lamp gets the job done. Extremely bright 10W double LEDS. Offering as much as 2400W of light for a consumption of about 450W. So you see it is an energy saver as well. Two switches for On/OFF. These are located on the back of the LED panel and control the brightness of the light. You can connect the Morsen lamp in a daisy chain and add two or three panels without the need for an extension cord. This is an extremely bright LED light which is ideal for the flowering stage of your marijuana plant. Another feature we like for larger growers is that the lamps can be connected in a daisy chain. However, do stay safe and only connect as many as three lamps. You don’t want a fire hazard in your grow room . Plus, there is the added benefit of the 3 year warranty (again a company that stands beside its products). A bit on the high side when referring to price, which is a slight concern because this lamp does not offer the ability to turn on and off certain LED colors as our prior choice does. The Viparspectra LED light models are well-known among indoor Growers. This maker is exemplary in all of its product line, but especially so in the par450 dimmable LED grow lights. This lamp offers three dimmers with a full spectrum layout and secondary Optical lenses for better growth. The viparspectra was first developed by indoor Growers and has improved over many years of careful experimentation and testing. When using this lighting system you will see an increase in the quality of your plant and the size of your flowering pods. Dimmable LED Grow Light allows you to dim or intensify the different colors as needed for the different growth cycles. Viparspectra lands are scientifically engineered so they keep the balance of the light with a quality par Lumen coverage plus the secondary Optical lens magnifies the par and increases penetration by up to 200%. The light spectrum on this lamp is adjustable and you candy Amor turn off the red white or blue LEDs. We also like the nice cool aluminum housing that protects the leds with heat sinks and high-speed fans. 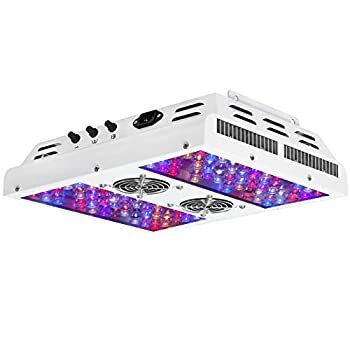 Once you decide to buy a new LED grow light lamp, all you really have to do is wait for it to arrive, hang it from it’s convenient hangers, plug it in and turn it on. Really, these lamps are that easy to use. However, the more experienced growers will want to control the way the light hits a plan and the type of spectrum that the plant receives during the different growing stages. Knowing when to turn on and off different colored lights really depends on your specific needs and the way you grow your marijuana. If you are inexperienced the best way to learn is by testing different light settings, and relying on the advice of other Growers. LEDS offer much more light per Watt than any other type of lighting system. They also run cooler and are energy efficient which translates to a lower electricity bill. Because they run cooler, they are safer to use and do not represent a fire hazard. They are simple to install and usually return a much higher yield. Experienced growers know that up until now setting up a grow room was difficult. Why do you think so few people did it. But now with these new LED lights, the process is simple. When growers used HID or HPS lights they needed to know the exact wattage of each lamp and change them out as the plants grew. LEDs are also defined by the Wattage they put out, although they do not use the same output wattage when drawing electricity from the system. This is a good thing, because LED grow lamps do not consume as much energy and do not cause your electric bill to soar. When you need to know the wattage for your growth needs, it is easiest to simply use the product’s advertised output wattage. For example, the minimum wattage, you need per square foot is about 40W, and the optimal wattage is about 80W. So if you want to have lighting for a 3ftx3ft grow tent, you have about nine square feet of grow space, which means you need about a 450W LED lamp to cover the entire area. You can get one lamp to do the job or two that you can daisy chain together. Growing cannabis is now legal or at least regulated in many states. And because the market is growing, there are now more efficient products and equipment for growing the plants. LED grow lights are one such product that is growing in popularity because of their efficiency. They are extremely easy to set up and use and one lamp can be used for the full life cycle of the cannabis plants. The above list are just a few of our favorite LED grow lights and they meet the specific needs of most plants. Use your plant room size to determine the wattage of the lamps that is best for your marihuana growing needs.